We want our patients to know Invisalign's® invisible, removable, and comfortable aligners will give you the beautiful straight teeth you've always wanted. And best of all, no one can tell you're wearing them. 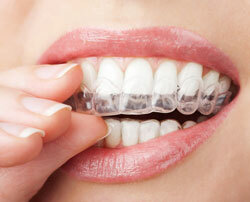 Invisalign is great for adults and teenagers. For more information on Invisalign treatment, or to schedule an appointment with Dr. Joseph M. Dickens call us today at (410) 583-0800!